The TIM-O is a flexible tool for classroom walkthroughs that can be used for formative feedback, peer coaching, grant evaluation, or professional development planning. The TIM-O is a web-based system that works on any device and requires no software installation. It is especially convenient to use on a tablet computer or smart phone. The TIM Observation Tool is designed to guide principals, teachers, and others through the process of evaluating the level of technology integration within a particular classroom. When completed, the tool produces a profile for the observed lesson in terms of the Technology Integration Matrix. The TIM-O provides a branching series of questions that helps to provide consistent results regardless of observer familiarity with technology integration. Skip-logic in the series of questions greatly increases the efficiency of the observation. Because classrooms and other instructional settings are varied and complex, the tool allows the evaluator to adjust the identified levels based on careful consideration of the observation as a whole. This lesson observation tool is based on the Technology Integration Matrix (TIM) developed by FCIT. If you are not familiar with the TIM, you should begin with the question-based option. We recommend that you observe the lesson for five to ten minutes before answering any questions. The question-based option is designed to arrive at a profile in a minimum number of steps. The total number of questions asked will vary depending on how you answer earlier questions. If you are very familiar with the Technology Integration Matrix and are comfortable with the observation protocol, you may choose to evaluate the levels of technology integration directly using the Matrix-based option. The Matrix-based tool is faster only if the observer knows the TIM very well. Without training, use of the Matrix-based tool can be more susceptible to subjective interpretation than the question-based tool. The TIM-O provides a space for the observer to take personal notes or work on draft comments. Personal notes and drafts do not become part of the observation record unless copied into the report comments field by he observer. Hyperlinks to other documents such as PDFs or photographs can also be added to an observation. The observer can preview the observation before electing to submit it to the system. 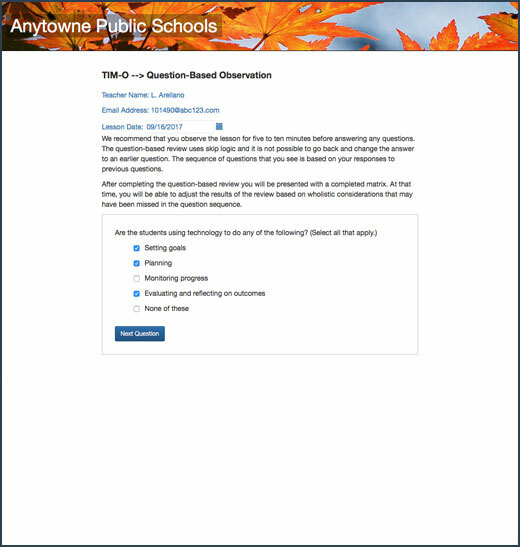 The observer can also email the teacher directly from the TIM-O or download a PDF of the observation. This tool is designed to guide principals, teachers, and others through the process of evaluating the level of technology integration within a particular lesson plan. When completed, the tool indicates a profile for the reviewed lesson plan in terms of the Technology Integration Matrix. With multiple lesson plan reviews, the TIM-LP helps evaluators get a clear picture of the professional development needs of the lesson plans to support further technology integration. This tool is designed to guide a teacher through the process of evaluating the level of technology integration within a particular lesson. When completed, the tool indicates a profile for the lesson in terms of the Technology Integration Matrix. With multiple reflections, the TIM-R helps teachers get a clear picture of their professional development needs to support further technology integration. The TIM-LP and TIM-R variations of the TIM-O were added to the TIM Tools suite at the request of client districts. Many districts were using the TIM-O as a tool for teachers to reflect upon their own lesson in addition to an observation tool. They found this to be a very valuable exercise for teachers, but in earlier versions of TIM Tools, doing so required making every teacher in the district an observer so that they could observe themselves. Other districts were using the TIM-O to review lesson plans, especially as a part of a grant evaluation project. Both uses, however, resulted in a TIM-O database where teacher reflections, observations, and lesson plan reviews were intermixed. 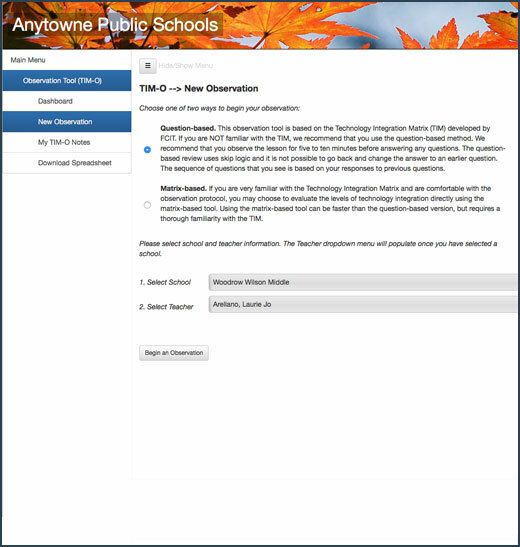 By separating out the TIM-R and the TIM-LP, districts can now use versions of the TIM-O for teacher lesson reflection or for lesson plan review and not have reflection and lesson plan data intermixed with actual observation data when they generate reports. The various versions of the TIM-O can be used in conjunction with each other. For example, an observer might request that teachers to complete a TIM-R reflection on the same lessons in which they were observed. The observation profile and comments can be compared with the reflection profile and comments in a follow-up conference as a starting point for a conversation about the lesson. Figure 1: Beginning a new classroom technology observation. The observer selects either the question-based or matrix-based method and then selects the school and teacher’s name from dropdown menus. Figure 2: A question-based observation. The observer answers a series of branching questions that use skip-logic to quickly determine the TIM profile for the observed lesson. Questions are either true/false or multiple choice, but all are based on observable behavior during the lesson. Figure 3: A TIM profile. 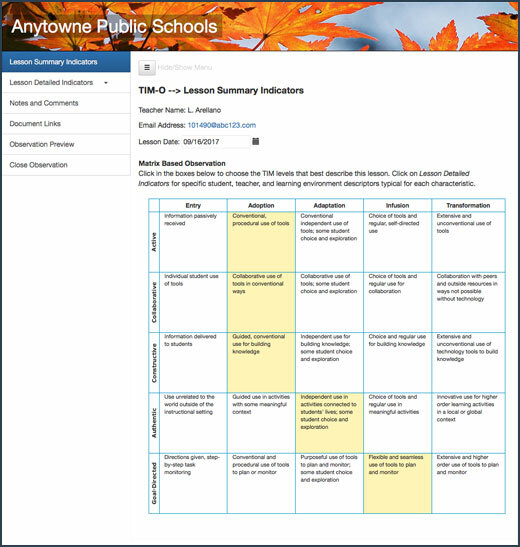 Observers who chose the matrix-based method will be taken directly to a blank matrix where each cell is selectable to build a TIM lesson profile. Observers who chose the question-based method will be taken to a completed matrix profile when they finish the series of questions. Observers using either method can then adjust the profile, add comments, insert links to additional documents and other supporting artifacts, and then submit the observation whenever they are ready. Figure 4: The TIM-O dashboard. Observers can access all of their previous classroom technology observations, provide additional edits, delete, or publish the observation to the system whenever they are satisfied with the lesson profile and their comments. Figure 5. A district summary report output as a series of webpages. Figure 6. A district summary report output for printing. Reports formatted for print can also be saved as a PDF.